Busy private practice with 8 Doctors looking for a Patient Service Representative / Chart Prepper to support Physicians and patients. The role is to work at the Front Desk for patient check in and to check and prepare charts for next day patient visits. The practice is centrally located in San Diego close to Scripps Mercy Hospital. This is a full-time permanent position with opportunity to advance with the practice. Pull and check up to 200 charts daily in preparation for next day visits. Check that all documentation is ready in the chart i.e. test result. Find and include any missing documents and test results, file in to patient charts using both EMR and paper charts. Back up Front Desk Receptionist as needed. Other duties as required by Office Administrator. Good computer skills / experience with EMR and paper charts. Strong knowledge of patient charts and documentation in charts as needed for Doctor to see patients for office / clinic visits. Experience with Medical Front Desk patient check in and out as well as appointment scheduling. Experience with insurance authorizations and referrals. Able to work independently, self-motivated. The position offers a starting rate of $16 – 18.00 hr. Health insurance and dental plan paid 100%. Paid holidays and vacation time off. 401K savings plan. This opportunity is offered through Plaza Personnel Service, a permanent placement employment agency. 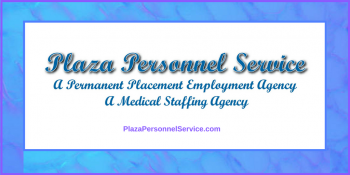 Plaza Personnel has specialized in direct hire staffing for medical offices in the San Diego area since 1991.